I am really looking forward to this and I can't wait for my group to test this out. Well, I will likely give it a try, especially since I want the new story cards - a pity it's only two! just support the game it isn't like drafting is that much money. You go to a movie for an experience drafting is the same it isn't wasted cards afterwards because you got four+ hours of fun out of it. Half arranged a draft event with my local store owner. No dates have been confirmed yet but will be as soon as I have a rough idea of numbers. Anyone is welcome and I know there are a bunch of UK players on here who I don't have on my Facebook so hopefully they will read this and choose to join us. If anyone is in this category, feel free to holla at me on here and we can try and arrange a suitable date. The link is to a discussion where we can arrange the who, what , when and why of the event. Me too. Since some announcements have implied that "Necronomicon" is only the first draft pool, I would expect that its card list and frequencies will be made a matter of public record when they move to publish the second pool. They're playing up the mystery of the pack composition at this point. Draft Cthulhu seems great, I'm happy to have the option. I understand that buying draft packs is not compulsory. I don't think I can arrange a draft night in here, but I'll get one starter and at least one draft pack to see what they look like. really hope more people would be drawn to this fantastic game, and I could experience the draft form gameplay one day. 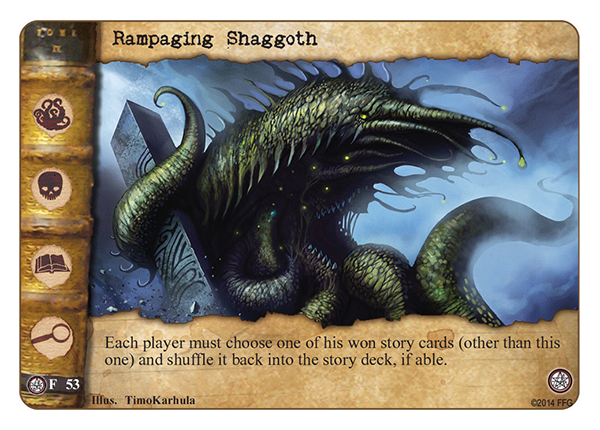 The artwork for rampaging shaggoth looks great. I got to test out the Draft with one of my players last night. It works much better than expected, and is incredibly difficult! I've got mixed feelings about LCG draft, as many people have since it was introduced. I'll certainly buy a starter+booster and give it a try, but it's far too expensive to buy new boosters on a regular basis. You can play Magic draft weekly but I don't think it's feasible to do this with LCGs. The reason is that with Magic (and other CCGs) you're paying for cards you would generally have bought anyway and then getting an event thrown in for free. Even if you have a big collection you can sell/trade what you don't need so you tend to get a good value for your money. In LCGs, you're buying an event, and then you have some leftover unplayable cards. They don't add to your collection, because in the LCG model you already HAD maximum copies of all the cards. This is why when draft first came out most of the threads were either about how overpriced it was, or about how to reverse-engineer your own draft packs to avoid paying for each event. I will admit that I haven't been following draft much since the early days, I am hoping that FFG has made improvements to give draft packs some greater value by now. We'll see. But it's very difficult to find the right balance because as soon as you give draft cards some value then you get into CCG territory where people may want to collect them all and I don't necessarily want that either. Alt art cards would be a nice incentive to buy draft packs and add some collection value, to echo what some other have said. If there is an alt art version of a card included in a draft pack, print it instead of the standard version. And come up with some new alt art for different cards. I'm sort of hoping that I'll be able to get some multiples of cards I use frequently. I find I'm always tearing apart decks and reusing cards in new ones. And yes, getting extra copies of certain cards that are used in very many decks could also be handy. AEG seems to be doing a good job choosing their game kit alt-art promo cards for Doomtown to target cards that show up in many decks such as Steven Wiles and Pistol Whip. Of course, it's a bigger issue there because most cards in that game are Neutral where in Cthulhu most cards only show up in decks that use those particular factions. However, there are exceptions and "colorless" cards such as Master of the Myths, Black Dog, Dreamlands Fanatic which break the general rule. For people without complete collections, reprints of popular Dreamlands cards would also be good value-adds as they break the general rule of "everyone already has everything", at least for the time being. Done right it could sink the overpriced, highway-robbery secondary market for alt-art promos online, ebay and otherwise. I don't mind fans of the game making a few extra bucks selling extra promos they got from a kit, but more often its gouging from various retailers who just see something they can slap online with a pricetag 3 or 4 times more expensive than what they acquired the promos/kit for. I don't mind having more than three copies of a card in my collection. I nearly always have four decks simultaneously built, and being able to use some cards in more than one of them is an option I'd appreciate. So there's at least a little gravy there. The other thing is that I envision "casual draft" play, where draft packs would recombine and recycle for future drafts, as mentioned in my earlier post on this thread. ha you think draft is to much now image the price if they had to commission alt art just for the drafts? sorry it won't happen. it hasn't even happen for netrunner which is lot more popular. I am surprised CoC community has such bad taste for the draft compared to the other lcgs. Netrunner and Thrones drafts have both been very successful and coc which out of maybe any card game in the whole worlds has the best mechanics for draft with how resourcing works and yet most people hate the idea. Sure drafts on a weakly bases isn't going to happen and ffg knows that. But once here and there to mix things up is great thing to have. Yeah, that's the reverse engineering I mentioned. You buy one pack and recycle it or make your own in order to avoid paying repeatedly. Personally, I'm in for one of every draft starter they make at the least, time will tell how many booster packs. I like extra cards in theory, but I have not been able to figure out an ideal way to store and track them yet. I guess I would probably keep them separately from the main cards? Don't really know. This has been an unsolved issue for me with all the AEG games I've tried so far as well as the extra cards from Netrunner, etc... I muddle by, but I'd really like to find a GOOD solution. Netrunner and Thrones drafts have both been very successful and coc which out of maybe any card game in the whole worlds has the best mechanics for draft with how resourcing works and yet most people hate the idea. Sure drafts on a weakly bases isn't going to happen and ffg knows that. Maybe this is true, but I haven't heard of it. I thought draft was a big flop and not many people were doing it because all I've ever heard is basically the same argument I outlined above and have never seen people playing draft of any LCG in person. Are we *sure* it's successful? I'd be interested in hearing hard evidence or how people use it to make it worth the cost. ha you think draft is to much now image the price if they had to commission alt art just for the drafts? well considering that netrunner is on its 3rd different draft pack whatever wanna call it I would be much more surprised if it wasn't doing well.